Dimensions (HxWxD): 2.15" x 2" x 1"
This stunning 2.15 inch wide Gemmy Aquamarine and Muscovite Cluster on Matrix, weighing 2.15 ounces or 64 grams, is part of a new find coming out of Sichuan Province in China. It's so brilliant and unique, it is an inspiration to think that our own Mother Earth is such a splendid artist. The aquamarine has great color and transparency in this specimen and the brilliant muscovite flakes shine within the blades surrounding the gemmy aquamarine crystals in the schist like matrix! 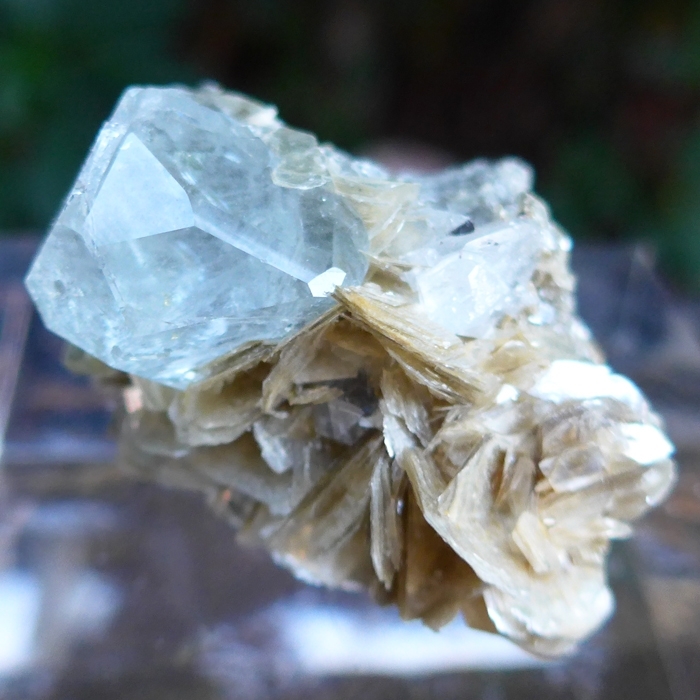 The combination of aquamarine and muscovite energizes the entire chakra system, enhances the flow of Universal Life Force energy throughout the human body and bio-field, and stimulates the throat chakra in particular, assisting in the communication of one's personal truth to others, one on one and through the mass media. This semi-precious stone assists us to assimilate new knowledge while remaining true to our own highest nature. 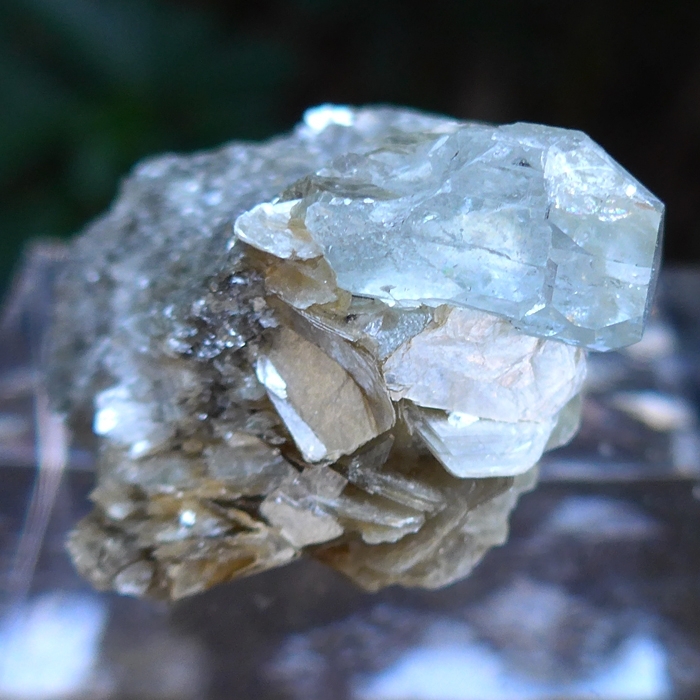 Aquamarine helps judgemental people to become more tolerant by reinforcing the connection with the Higher Self while clarifying mental activity of all kinds. It is a stone which encourages flow, balance, protection & clarity, attuning us to spiritual worlds while enhancing the connections between our intellectual, emotional and spiritual bodies. Medieval rockhounds called muscovite Lapis Specularis meaning stone mirror. Muscovite was originally found in the Muscovy region of Russia. Muscovite is a soft, vitreous, silky, pearly form of mica that displays as silvery white sheets and as flaky highly reflective grains in rock formations. 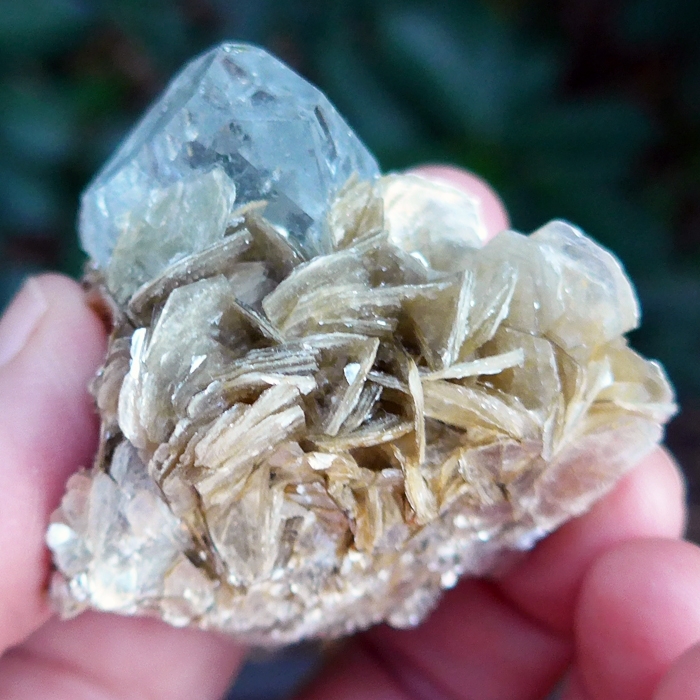 You can see the muscovite on the bottom of this gorgeous cluster in the photo below. 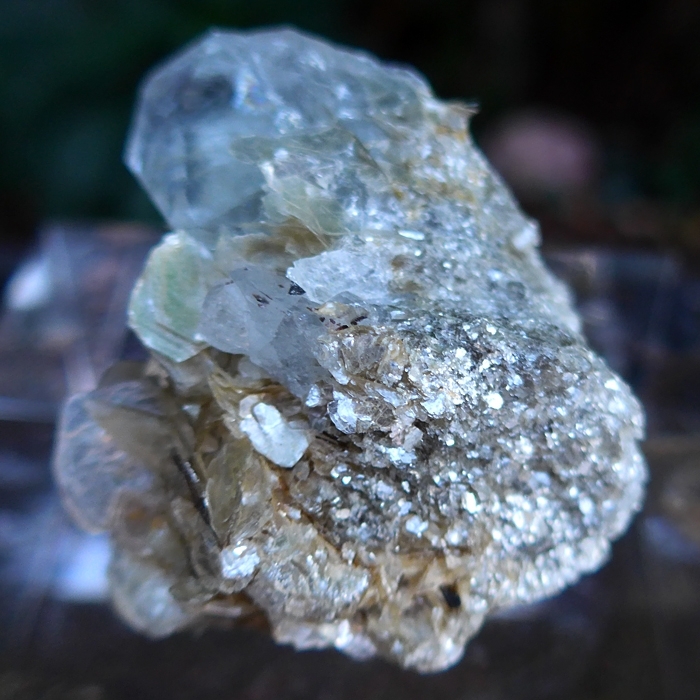 Muscovite reflects the light in a spectacular fashion so metaphysically, this mineral amplifies the ability of crystals and gemstones to receive and transmit subtle energy! Mica can assist you in accessing more light within during meditation sessions and also in transmitting more light out into the world. Crystal healers say that Muscovite is an ideal tool for enhancing self-confidence, intuition and communications skills. This gemstone cluster has been cleaned with Universal Life Force Energy, and given an energy attunement using Reiki, a Japanese technique of energy healing, so it will continue to receive and transmit Universal Life Force Energy direct from the Source of Creation. It has also cleaned and charged with the natural energy of sunlight. It is ready for you to program according to your own needs and desires. We know that you will use this powerful gemstone cluster with loving wisdom and respect its long journey in the Earth that has lasted for many long historical cycles. This crystal is a powerful tool, a love-gift from the Divine Mother and we are honored to offer this piece to you with the utmost respect and appreciation. Note: weight above is shipping weight. Net weight is 2.15 ounces or 64 grams.